One of the main traditions of the Hebrew Purim holiday is dressing up. 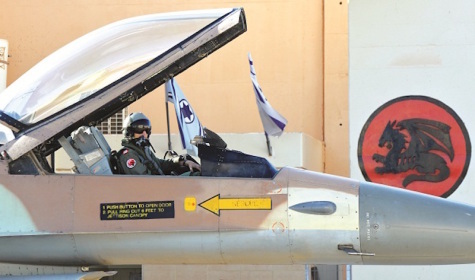 There is one IAF squadron that celebrates Purim every day – the 115th ("Flying Dragon") aggressor squadron, which operates the "Barak" (F-16 C/D) fighter jet. The squadron's main objective is to train alongside the force's various squadrons while acting as the hostile force, practically "dressing up" as the enemy. "The squadron simulates the enemy and the way they operate", said Lt. N', an air traffic controller at the squadron. Usually, the training fighter squadrons arrive at Uvda AFB and train alongside the 115th Squadron, which establishes the training plan according to the visiting squadron's needs and the current relevant threats in the operational theatre. The 115th Squadron's mission is to improve the force's capabilities and increase its wartime preparedness. In spite of the advanced simulators and modes of training available in the IAF, nothing can replace flight against actual aircraft. The squadron's aircrew members use Arab names and foreign nametags, and their ranks are painted red, all in order to distinguish them from the participating squadrons and to simulate the enemy as realistically as possible. "When establishing a training plan, I try to think about what would be challenging for me in the air", said Capt. G', an aircrew member at the squadron. "I think about things I'd never experienced during my service. Furthermore, we work with the IAF Training Department and plan our exercises according to operational scenarios". Every week, squadrons arrive at the base in order to train with the "Red" aggressor squadron. "I direct the 'Red' aircraft according to the 'Blue' force's operations", elaborated Lt. N'. "We adjust the training according to the visiting forces, and listen in on the radio communications during operation in order to ensure that it is at the appropriate level". The squadron also holds ground exercises meant to prepare the visiting forces for ground threats. These exercises are performed using various instruments, including SAM (Surface-to-Air Missile) batteries, warning flares and simulated terrorist cells. They also simulate Israeli forces, such as ejecting pilots or combatants in need of extraction from enemy territory. How does the aggressor squadron estimate the enemy's modes of operation? "Our simulation is based less on decision-making, and more on the platforms available to the hostile forces", replied Lt. N'. "We can simulate the aircraft and munitions utilized by the enemy, and the 'Blue' force will then operate accordingly". "The focal point of each and every squadron and unit in the IAF is operational activity. We act as professional examiners, providing each squadron with information regarding its strengths and weaknesses", added Lt. N'. "Operating as an aggressor force is different to operational flight", elaborated Capt. G'. "My goal is to make the training forces experience everything we planned during the training. At the same time, we have to maintain a high level of safety during sorties of this sort". The 115th Squadron and the opposing "Blue" squadron may fly against one another, but they work together. "We don't actually operate 'against' the other squadron, seeing as our main goal is holding an optimal exercise", concluded Capt. G'. "If the visiting squadron experienced a difficult exercise, then we both succeeded".